The Battery and Electrochemistry Laboratory (BELLA) at the Institute of Nanotechnology (INT) is funded equally by the Karlsruhe Institute of Technology and BASF SE. It is part of the BASF scientific network on electrochemistry and batteries. 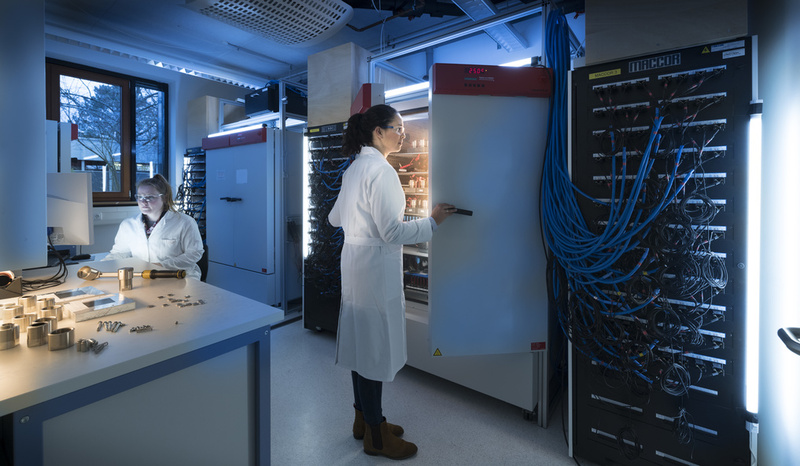 Research at BELLA combines fundamental work with application-driven projects on active/inactive materials and other cell components for next-generation lithium-ion and lithium batteries. The infrastructure and equipment in the laboratory support a variety of synthetic work including electrochemical characterization of electrode materials and electrolyte systems and the study of half and full cells. For more details on current research projects see the KIT/BASF Joint Laboratory BELLA website. BELLA is headed by Prof. Dr. Jürgen Janek, Research Unit Chair at the INT and head of the Institute of Physical Chemistry at the Justus-Liebig-University Giessen, and by Dr. Andreas Fischer, BASF’s vice-president of battery research and electrochemistry (Ludwigshafen). Two lab managers, Dr. Pascal Hartmann from BASF SE, and Dr. Torsten Brezesinski from the KIT, are in charge of the daily operation of the laboratory.